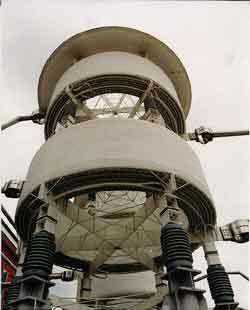 Some high-voltage substations contain large air-cored "reactors" (a reactor in this context is just a large coil). These can be used as part of a Static Var Compensator (SVC). This is a way of adding either capacitance or inductance to the electricity system, depending on which is needed. The air-cored reactors provide the inductance. They can also be used as filters to filter out particular unwanted frequencies. For more on reactance, inductance etc see our tutorial on power systems. These fields exceed both the occupational and the public exposure limits in the UK. To ensure compliance with the occupational limits, there is usually a fence round the reactors at a distance corresponding to the occupational limits when the reactor is at full power. The public exposure limits are relevant only outside the perimeter fence of the substation. Usually, the reactors are sufficiently far inside the perimeter fence that the field outside the fence does not exceed the public limits. The highest field measured so far at the perimeter fence of a National Grid substation from these reactors is 20 µT. Other companies may design their substations with less space inside the perimeter fence, which could result in higher fields. This would still only be a problem if the land immediately outside the perimeter was somewhere where the public spent extended periods of time, which is unlikely.